Location: Property has frontage on Route 107 (Freetown Road) and Center Street, across from Westbound Route 101 Ramp, Exit 5. (Parcel is visible from the 101 westbound ramp.) 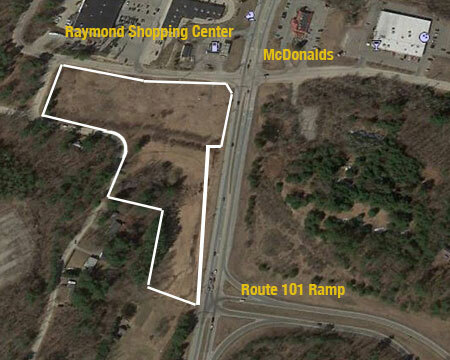 Located in the center of commercial activity in Raymond– within a quarter mile of the property are a McDonald’s, Dunkin Donuts, Shop ‘n Save, Rite Aide, etc. 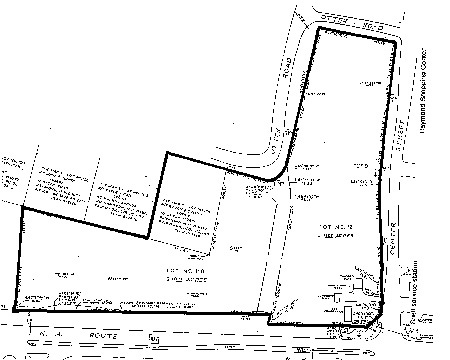 Land Area: 7.2± acres with 800+ feet of frontage on Route 107 (Freetown Road) and 650+ feet of frontage on Center Street in addition to frontage on Otter Road. Utilities: Town water available, private septic on-site systems, PSNH electric power. Description: 7.2 ± aces with 800+ feet of frontage on Route 107 (Freetown Road). Located across from Route 101 Exit Ramp. Owner will subdivide.